A clear goal and vision – more than just a music store. We are experts in the field of saxophones and clarinets. All instruments have been tested at the manufacturer’s and hand-picked by our experts. Surrounded by choice and are not sure which saxophone/clarinet is right for you or your child, which accessories you need for your instrument, and wish to test everything with the help and advice of a professional? DESIGN YOUR SOUND means that we are aware of the wide range of musical tastes and ways of playing, and are also aware of the issues and flaws of the classic process of purchasing an instrument. searching for the appropriate instrument type by taking into account current knowledge, desire, and ambition. At your request, the instrument may also be chosen by your teacher or one of our experts, personally at the manufacturer’s. mouthpiece, ligature, and reed; complementary to the instrument. 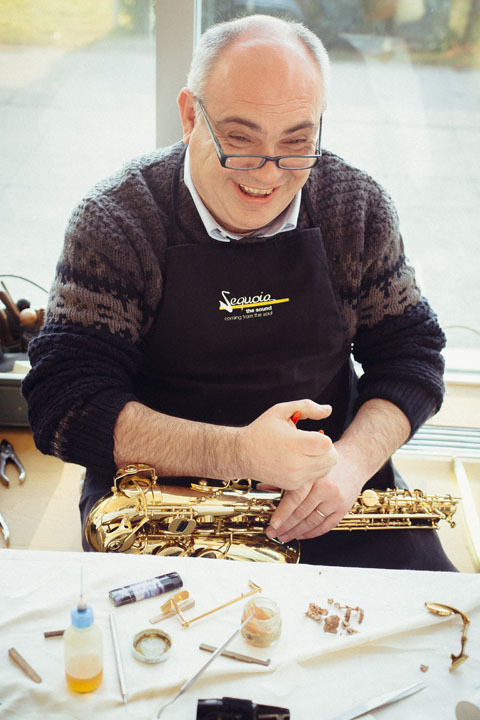 we also take care of you after the purchase as we are in collaboration with the best maintenance man who takes care of quality maintenance and repair of all brands of saxophones and clarinets. Z nakupom ne boste dobili le odličnega inštrumenta, temveč postanete del družine in filozofije Vincera, ki verjame v socialno podjetništvo - podpora pedagoškim in umetniškim projektom kot so SOS, SOSjunior, Festival AS in ALPSAX Summer. V našem podjetju smo za serviserja izbrali zagotovo najbolj priznanega serviserja v širši regiji (Slovenija, Hrvaška in Furlanija v Italiji). Z veseljem bomo prevzeli Vaše naročilo, ga posredovali mojstru Roberto Buttusu, prevzeli vaš inštrument in Vam ga v dogovorjenem roku tudi vrnili, da bo ponovno "kot nov". Naprošamo Vas, da izpolnete formular in odgovorili Vam bomo v najkrajšem možnem času.